Born in 1979 in Zurich, Swiss-Spanish composer/improviser Tomas Korber received a five-year musical basic training (theory/clarinet) starting from 1988 and guitar lessons starting from 1992, which he quitted after four years being unhappy with the restraints of academic tutelage. Early interest in diverse experimental music directions (electro-acoustic, contemporary, free improvisation, etc.). Self-taught schooling in electric-guitar (and electronic devices) since 1993. Korber has written various compositions and played improvised music since the early 90ties. 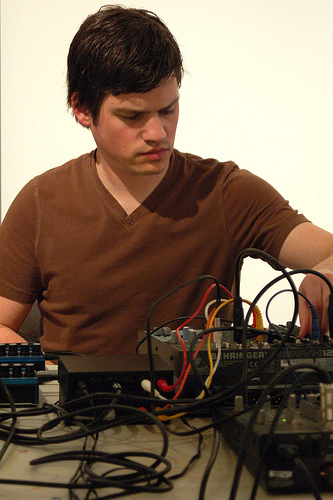 He has worked solo and collaborated with the likes of Günter Müller, Norbert Möslang, Otomo Yoshihide, Lê Quan Ninh, Toshimaru Nakamura, Stephan Wittwer, Jason Kahn, Thomas Ankersmit, Dimitri de Perrot, Dieb13, Butch Morris, Alessandro Bosetti, Hans Koch, Sachiko M, Christian Weber, Keith Rowe, Christian Wolfarth, Kazuya Ishigami, Olaf Rupp, <strøm> (collaboration at the Swiss National Exhibition “Expo02”), Andrea Parkins, eRikm Steinbrüchel, Keith Fullerton Whitmann (aka Hrvatski), Lionel Marchetti, Charlotte Hug, Adam Sonderberg, Mattin, Taku Unami and many others.